Environments that are modified by human activities experience great changes within short periods of time. This is particularly true of refuse dumps and composting facilities, biotopes which have still not been adequately investigated. Our wasteful treatment of foodstuffs is resulting in a steady increase in the proportion of organic wastes in many dumps, and this in turn promotes the formation of ideal breeding and feeding sites for many species of animal, including those of hygienic importance. Some of them are able to take advantage of the favourable conditions of temperature, humidity and food-availability and develop huge populations. There are many species of insects, and especially of two-winged flies (Diptera), that are closely linked to human refuse sites and are able to develop there almost without competitors. 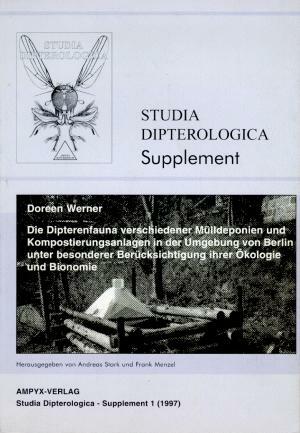 The present work is based on comparative ecological investigations of the macrofauna at five different refuse sites and composting facilities in the area of Berlin. The Diptera were the centre of interest. Other groups with representatives in the macrofauna, such as the Isopoda, Chelicerata, Collembola, Orthoptera, Heteroptera, Homoptera, Coleoptera and Hymenoptera, are also mentioned. In addition to the biology of individual species, their interactions and the community structure within this biocoenosis are discussed.